Matthew Bourne has carved out an odd niche for himself re-inventing the story ballet for a new century. Previous works include a “Swan Lake” featuring buff male swans, a “Nutcracker” which took place in a Dickensian orphanage, “Car Man,” which was a sort-of retelling of the movie “The Postman Always Rings Twice”, and “Play Without Words” which was based on the 60’s era movie, “The Servant”. Now, he’s done an all-dance version of the Tim Burton movie, “Edward Scissorhands”, which opened its American tour in San Francisco on November 14. Bourne grew up going to musicals and movies and came to dance late. He studied acting but felt self-conscious and found dancing to be a better medium for himself as a performer. In college, he started a dance company and began creating works that combined his particular blend of interests. His is a unique formula that has worked for him extremely well. He is more entrepreneur than choreographer, more choreographer than director, more director than playwright. And the odd theatrical mash-ups he creates work on a simplistic basis that appeals to a mass audience specifically because one doesn’t need to be a balletomane, theatrical aficionado or movie expert to appreciate them. 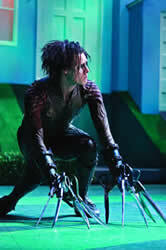 “Scissorhands” is like “Grease” with a stranger male lead. The role played by Johnny Depp in the movie is a kind of lost innocent in a suburbia, a kinder, gentler, much cuter Frankenstein’s monster. There is not much logic involved in the beginning and end of the story (as in, why the scissor hands?) but a “narrative” here, like a traditional story ballet, is merely an excuse for one dance number after another. This is one big dance hullabaloo. If Bourne previously created a “Play Without Words”, this is a ‘Broadway version of a Movie Without Songs’. Good news for anyone who enjoys the big dance numbers in musicals and gives not a whit about anything else. There is nothing else here. The production team has adapted the musical score and screenplay from the movie quite closely, although the set and costume designer, Lez Brotherston, has taken-on the difficult task of recreating the movie’s “look” on stage, complete with dancing topiary. Bourne’s dances are lively, his cast is full of likeable actor/dancers. The overall effect is like a slightly edgier Disney musical—-without the Elton John songs. Sam Archer, who alternates as Edward (the Johnny Depp look-alike) with Richard Winsor, does a good job of wandering through this pop-colored world, the ultimate outsider. It is sweet that in this telling of the Frankenstein myth, he spends most of the story loved and not reviled, but he has the unenviable task of having to dance with his flashing, twitching scissor hands. That’s the main tension in this “play”– who will get cut. The lack of usable hands makes for some clunky choreography in the love duet near the end, but otherwise this is a dancefest for those who enjoy that sort of thing, another mass-market concoction Bourne has created that is remarkable for its pop-cultural borrowings, without creating anything particularly effective, theatrically. “Edward Scissorhands” isn’t so much original as it is unique. Bourne is a marketing guy who knows how to dance.